Busy families need quick and easy breakfast options, but there is a challenge finding options that offer wholesome ingredients. That’s where Good Food Made Simple comes in! They believe in only using fresh ingredients and not adding more than anything absolutely necessary. They use organic and Non-GMO ingredients whenever possible, and all are free of artificial ingredients like artificial preservatives, flavors, colors and sweeteners. See what Emilee at Pea of Sweetness and her family thought of their wholesome breakfast options. 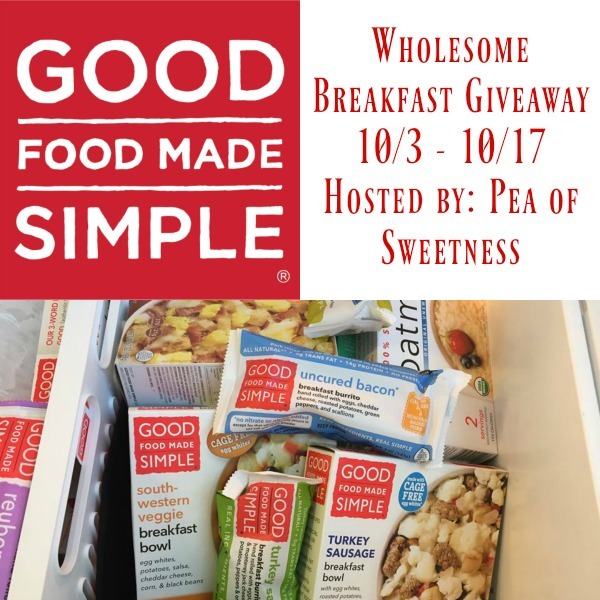 One winner will receive three full product value coupons for Good Food Made Simple breakfasts. This giveaway runs through 10/17 at 11:59pm Eastern Time and is open to US residents ages 18+. Previous post: $250 Cash Giveaway Event! Next post: Dr. Fedorenko True Organic Skin Care Giveaway! I’d really enjoy any and all of them I think but the Spinach Scramble and the cheese and veggie breakfast burritos look especially yummy. I want to try the southwestern veggie bowl.